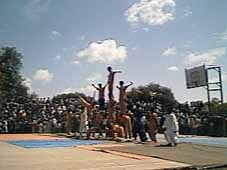 ** September 1998: A small Circus Dire Dawa delegation travels scross the border to Somaliland in this first cultural exchange between the two countries. Three performances are organised to over 6,000 people. Training workshops are held daily in the Circus Hargeisa compound.